Alexia Sinister, also known as Alexia Sanister, Alexis Gluipstra and Alexis Sinister is an Adventurers Dino Island minifigure introduced in 2000. Her hair is black and goes down along the sides. She has a stern face with red lips. Her torso is grey and has a white shirt underneath. Her pants are black. Alexia Sinister is the sister of Sam Sinister. While Sam Sinister determines what treasure they attempt to steal, Alexia is the one who comes up with the plans to do it. She also keeps attempting to make Johnny Thunder join them as a villain. 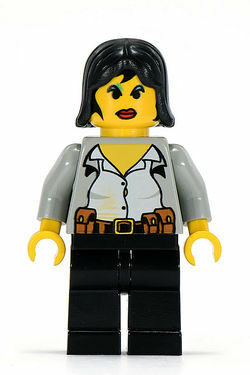 In LEGO Racers 2, Alexia Sinister is named Alexia Sanister. She appears as a side character on Dino Island the player can talk to while exploring, and gives a hint regarding the location of a Golden Brick. In the Netherlands, she is named Alexis Gluipstra. In Standing Small: A Celebration of 30 Years of the LEGO Minifigure, her name is given as Alexis Sinister. This page was last edited on 20 November 2018, at 18:17.